On Saturday May 14th in Munro Martin Park, Balkanu Cape York Development Corporation and the Traditional Knowledge Recording Project will host an event titled Dr. Celebration to help celebrate a landmark and historic occasion. The day will feature live indigenous music, live bands, dancers, performers, guest speakers and information and food stalls. 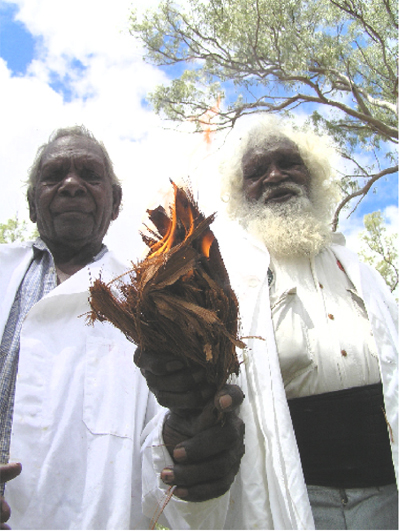 Two Elders involved in the Traditional Knowledge Recording Project (TKRP) have each been nominated by Balkanu Cape York Development Corporation in close collaboration with James Cook University in seeking recognition of their traditional knowledge, contributions to research, maintaining a significant indigenous cultural system and ensuring its survival for generations to come by way of the TKRP. The Elders involved have built up a relationship of trust with JCU and are aiming to ensure the survival of their inherited Traditional Knowledge with future collaborations in research on traditional land, water, flora and fauna. Through the research work and adoption of Traditional Management Practices the aim is provide sustainable solutions to current shortfalls in land management and water conservation strategies. The Traditional Knowledge Recording Project (TKRP) is a nationally significant project because it shows the importance of understanding and utilising inherited Traditional Knowledge in social and environmental management issues. The project aims to research, record, document and utilise inherited traditional knowledge systems to show their benefits in land and water management, natural and cultural resource management and to break the welfare dependency by providing real training and employment opportunities for indigenous people across the Cape York Peninsula. The philosophy behind the TKRP came about through consultation to address an issue that Kuku-Thaypan Elders George (Snr) Musgrave and Tommy (Snr) George were faced with, an impending loss of a significant indigenous knowledge system. The pilot project has been running for three years under the guidance of the Balkanu Cape York Development Program. It involves Kuku-Thaypan Elders George (Snr) Musgrave, Tommy (Snr) George and Victor Steffensen recording, demonstrating, documenting and utilising their Traditional Knowledge to address key areas of concern for their community. The pilot Traditional Knowledge Recording Project aims to make up for the lack of knowledge transfer in a manner as defined by the Elders. The rapidly disappearing identity, culture, language and inherited knowledge of the Indigenous Clans are all immediate concerns of community Elders. Environmental and social concerns such as current poor land management and water conservation strategies, the degradation of rock art in ill-timed burn offs, salinity of lagoons, poor land use and fire techniques are all key areas of concern that can be addressed by utilising, recording and documenting Traditional Knowledge and its practices in contemporary community settings. The TKRP is an ambitious documentation and recording database of traditional knowledge. The main aim is to record Traditional Indigenous Knowledge from Elders of from clans all over Australia, but the first clan to be focussed on is the Kuku-Thaypan clan. George Musgrave and Tommy George are the only two surviving Elders with traditional knowledge and a fluency in the Kuku-Thaypan language. The project records all aspects of their language and culture, from fire, land and water management, to indigenous medicines, uses for flora and fauna and how all of this inter-relates. The Traditional Knowledge Recording Project is based in the Balkanu offices on Grafton Street. Balkanu is the peak non-government organisation responsible for Aboriginal development issues on Cape York Peninsula. It is owned and run by the indigenous people of Cape York, through the Cape York Aboriginal Charitable Trust. Balkanu employs over forty people (more than half being indigenous) in fields such as land and sea management, housing, cultural maintenance, property planning, business development, communications and advocacy. Balkanu is a not-for-profit organisation that is based in Cairns in the Cape York Peninsula of Queensland. The project has been running for three years and has so far recorded, documented and entered a large amount of valuable and timeless information into an extensive database. The project has already gained international recognition for its fire management practices (University of California), and now, with impending recognition from James Cook University, a huge amount of interest has developed as a result. The project aims to go further, by recording language and culture and raising an awareness of how valuable and effective the knowledge is in land and water management, developing and fostering culture and language and giving an identity and a sense of worth back to many indigenous communities. The project is being used as more than a pilot and has developed a recording database to be used in all communities across Australia to record traditional knowledge and to implement traditional practices. Conducting burns in traditional land management practices to enable re-growth and prevent destructive fires (especially) around ceremony and rock art areas. Protecting the Low Lake area (Lakefield National Park, QLD) in the water management and conservation to rehabilitate and preserve sacred spiritual and story place. Monitoring waterways, lagoons and fish stocks and continuing ongoing natural resource management practices across areas of the Cape York Peninsula. This is being done primarily to care for their country and to demonstrate the viability behind traditional practices by gaining valuable supporting evidence and documentation. The project has been involved in all aspects of the Caring for Country unit run under the Balkanu Cape York Development Corporation. The spark for their recognition with honorary doctorates came about by way of this project highlighting and demonstrating the importance of traditional indigenous knowledge systems and their relevance in contemporary settings. The recording of indigenous knowledge is taking place on location at Low Lake in the Lakefield National Park (Kuku-Thaypan country) by Victor Steffensen. Tommy George and George Musgrave were both born in the Low Lake region in Lakefield National Park, or what is traditionally known as Kuku-Thaypan country. Tommy George is the younger of the two and is 78 years of age. George Musgrave is 85. Their age is remarkable considering the national life expectancy for indigenous males is a shocking 56 (Australian Bureau of Statistics, census 2001). It is a true testament to living actively under traditional practices that they have achieved such a strong and healthy life. Tommy and George both managed to stay on Kuku-Thaypan country in what are exceptional circumstances for their time. They were only able to remain on-country by being hidden in mailbags by the station owner, Fredrick Sheppard, whom they had worked for since the age of ten. Unknown to the station owner at the time (who was probably more interested in keeping workers), they were able to live with their family and learn about the significant indigenous knowledge system of the Kuku-Thaypan people in the traditional manner. This was something exceptionally rare for this period in time. The two learnt the traditional law and language, the management practices of their country and most importantly, how to survive. All of this took place during a time when the police and trackers would take Aboriginal children away from their families and place them on missions under what is now infamously known as the Aboriginal Protection Act. By being hidden by Fredrick Sheppard and with the help of their families, they were able to avoid becoming part of what is now recognised as The Stolen Generation and managed to ensure the survival of a significant indigenous knowledge system. After leaving the Sheppards station, George went on to work for other station owners around the Cape and was eventually recruited by the police force to work as a tracker due to his intricate knowledge of the area and of traditional knowledge practices. During his time as a tracker he aided in finding lost tourists and missing children. He also helped in the capture of criminals and located drug crops and assisted in drug raids. Tommy went on to work for the Community Development Program, which folded before too long due to the lack of funding and resources (as was common with many of the earlier Government attempts at solutions to indigenous community problems). Tommy maintained the work with no pay to ensure that the transfer of inherited knowledge in land and resource management continued. Tommy took the initiative and took on the title as Head Ranger of Lakefield National Park to manage the country from an Aboriginal Land Management perspective. Both he and George are working as self-appointed Care-Takers of the Lakefield National Park in the hope to see their life-long ambitions of seeing the country run in a sustainable way under traditional land, water and natural resource management practices. George Musgrave and Tommy George can always be found on-country tirelessly working to teach, demonstrate and mentor indigenous and non-indigenous people to run the country in the traditional way. They are always helping to pass on inherited traditional management responsibilities to their clan, other mobs and all people. A great number of linguists, anthropologists, ecological researchers, botanists and social researchers have had their careers launched from the knowledge passed on by Tommy and George and other Indigenous Elders. Most researchers will call on Tommy and George first before starting any type of research in the Cape York Peninsula. A lot of doctors and researchers owe their careers, books and published works to these two. If you would like to know more about the project, Tommy and George, or are interested in following this story up, come along to the celebration day on May 14th in Munro Martin Park, Cairns City Centre.